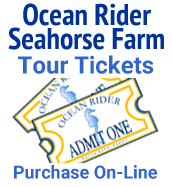 What Does Ocean Rider Use for It’s Aquarium System? The system I recommend is a SHOWLR tank, which I imagine is something similar to the system you are running on your reef tank. Rather than discussing all of the different filtration options and systems that are commonly used to keep the greater seahorses, I am going to focus on one particular method that I have found produces the best results for me and describe how to set up such a system in detail. One reason I prefer this method is that it is very versatile and can easily be adapted to suit almost anyone’s needs and interests. The setup for greater seahorses I prefer, and which most hobbyists favor at this time, is know as a “Sea-Horses-Only-With-Live-Rock” system, or a SHOWLR tank for short. It is simplicity itself, extremely effective for seahorses, and endlessly adaptable. It is suitable for tanks from 5 gallons to 500 gallons, and can be adapted successfully to suit the simplest setups or the most complex, high-tech systems. And an external power filter to provide water movement and supplemental chemical/mechanical filtration, as desired; power heads can be added as needed to increase circulation and eliminate dead spots. For best results, I’m also a big fan of a well-designed sump / refugium and a properly sized and maintained UV sterilizer for a seahorse setup.